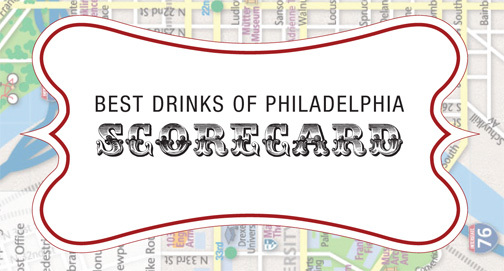 Earlier this week, Foobooz posted a list of what they have determined to be Philadelphia’s Best Drinks. While the list looks pretty comprehensive (I don’t see any glaring omissions at a glance), we haven’t had nearly all of these drinks, so we can’t say for sure how accurate it is. The only way we can think of to check their work is to try them all, so we’ve thrown together scorecard. Feel free to download it here and print it out if you’d like to join us in a boozy tour of the city. We’ve even included a map to show where the bars are in relation to each other. All in good fun, of course. We can’t take any credit for making the list, but this seems like as good an excuse as any to do a little drink exploring! I understand that Foobooz was trying to profile no bar twice, but I would guess that 15 of the best 20 drinks in Philly can be found at the Franklin and at Ranstead Room. In particular, the Sweet 16 in Leather Boots at the Franklin is the best cocktail I’ve ever tasted – 1.5 oz. aged rum, 0.5 oz. rye, 0.5 oz. Luxardo triplum (or gran Marnier), 0.5 oz. simple syrup, 3 dashes cinnamon tincture, 2 dashes each of angostura and Jerry Thomad bitters; shake and serve over one large ice cube. Fantastic. That one is one of my favorites! The cinnamon really makes a huge difference. And while I do agree for the most part (I’d put Southwark and Farmer’s Cabinet on the same level as the two you mentioned), I already know Franklin and Ranstead have great drinks. Without this list, I never would have realized that the bartenders at some of these other places really are doing some damn good work. So yeah…while I do agree, I’m glad it wasn’t just a list of Franklin drinks. That’d be like releasing an article to inform me that water is indeed still wet.